This semester I am teaching a class entitled “Old Testament Poetic Books.” In order to give you a glimpse of what an entry level course is like at DBTS, I wanted to do a series of blog posts summarizing most of my lectures. With this post, I provide the course requirements, a few sources and a link to the complete bibliography. Here are the course requirements. Course Descriptions: A study of the key elements of Hebrew poetry, the argument of the book of Job, key Psalms as they relate to their literary genre, the book of Proverbs as it relates to skillful living, the message of Ecclesiastes, an interpretation of the Song of Solomon, and the book of Lamentations. 1. Tests: There will be three major tests. The first exam will cover pp. 1–49 of the syllabus, the second exam, pp. 50–106, and third pp. 107–154-—90% of grade. 2. Reading Requirement: If the student completes all the assigned reading in accordance with the reading schedule, he will receive a 98%-—10% of grade. Bullock, C. Hassell. HAn Introduction to the Old Testament Poetic Books: The Wisdom and Songs of Israel. Rev. ed. Chicago: Moody Press, 1988. McCabe, Robert V. “Old Testament Poetic Books.” Unpublished syllabus, Detroit Baptist Theological Seminary, 2011. To download the complete bibliography for OT Poetic Books, go here. 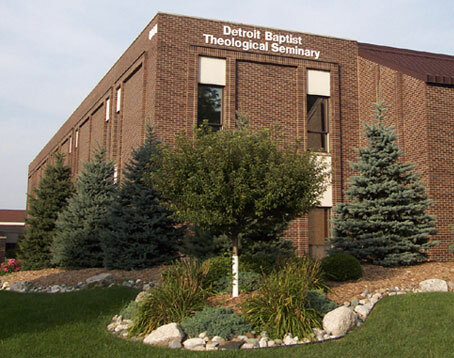 On Wednesday, March 2, Detroit Baptist Theological Seminary will host its annual William R. Rice Lectures. This year we will be privileged to have Dr. Terry Mortenson from Answers in Genesis. His lecture relates to the compromise theologians have used to reinterpret biblical texts to support an old-earth. Dr. Mortenson has earned an M.Div. from Trinity Evangelical Divinity School and a PhD in the history of geology from the University of Coventry in England. He has used his dissertation to write a helpful book entitled The Great Turning Point: The Church’s Catastrophic Mistake on Geology–Before Darwin. Here is an announcement that Dr. Claude Wiggins sent out to friends of DBTS. The Seminary is hosting the 2011 William R. Rice Lectures on Wednesday, March 2nd. We would love to have you join us for the morning (8:30 a.m.-12:00 p.m.). Feel free to bring with you staff members, other church leaders, and college students. The lectures will be followed by a luncheon fellowship. This year’s theme is “Millions of Years and the Compromise of the Theologians.” Our speaker will be Dr. Terry Mortenson, a researcher and lecturer with Answers in Genesis. Additional information about the 2011 Rice Lectures, and Dr. Terry Mortenson, can be found on the Seminary website. Media resources will be available on the website following the lectures. There is no cost to attend the lectures or the luncheon. However, advance registration is requested. I am looking forward to Dr. Mortenson’s lecture and can highly recommend that you will profit from his lecture. To sign up for the lecture, contact the Seminary at (313) 381-0111, or by email at info@dbtsedu. Yesterday, January 22, marked the 38th year since the Supreme Court decision in Roe v. Wade. This day grieves me. Based on statistics from 2005 to 2008, 1,206,200 unborn babies are annually murdered. While this enormous number of abortions is alarming, we are equally alarmed because many Bible-believing Christians are surprisingly uninformed, in some cases apathetic, about the Bible’s teaching on this subject. My goal in this post is to present a biblical understanding of abortion. To fully understand what the Bible has to say on this subject, we will examine three issues: the reason why the Bible never explicitly discusses abortion, the Bible’s teaching concerning the value of human life, and its teaching about the inception of human life. Before we examine these issues, we will initially define abortion and define some of the issues associated with it (I wrote this brief article a number of years ago but decided to resurrect it because this gross sin continues; for a post that I did last year, go here). I had a busy and enjoyable hiatus from the academic rush of DBTS‘s fall semester. As well as preparing for classes and working on some other academic projects, it was great to relax with my wife, family, and friends. However, I am looking forward to the start of a new semester with our first full day of classes starting tomorrow. This spring semester I am teaching three classes: Old Testament Poetic Books, second semester of Elementary Hebrew Grammar, and Old Testament Introduction. I have uploaded the course requirements for each of these classes. If you are signed up for any of my classes, or just want to see what these classes look like, you may get a concise overview for each class and then download the complete set of requirements by clicking any of the following links. Because I have been overwhelmed with some domestic, ministry and academic issues, I have been impeded from posting much on my blog. In any event, I have been planning to do a post about my participation with a creation fellowship at the Evangelical Theological Society this past November and figured that I should upload this post before the spring semester begins at DBTS. For the past three years, I have been a part of a Creation Consultation group at the annual meeting of the Evangelical Theological Society. The format of these meetings involves the presentation of three papers with differing views on creation (30 minutes for a paper plus 10 minutes for questions) followed by a panel discussion (40 minutes). The panel discussion is comprised of three biblical scholars who present a paper along with another who does not present a paper but has done writing on creation and a moderator for the panel discussion. When we met for the first year, I presented a paper and this past year I was part of a panel discussion as the one who did not present a paper. The theme of this year’s meeting was “Intertextual Issues Relating to the Exegesis of Genesis 1″ (to see the program for last year’s ETS meeting, click here). The three papers presented this year were “The Role of Genesis 2-4 in our Understanding of Genesis 1″ by Dr. C. John Collins, “The Role of Psalm 104 in our Understanding of Genesis 1″ by Dr. Richard E. Averbeck, and “The Role of Proverbs 8, Job 38-40, and John 1 in our Understanding of Genesis 1″ by Dr. Bruce K. Waltke. Since I was a participant on the panel discussion, I prepared a response for each paper. Dr. Bill Barrick was the moderator of the panel discussion. As it turned out, my responses turned out to be for my own personal edification since I only had time to state what I believe about literal days in the creation week. When our panel discussion started, it was opened up for questions from the floor and all attention and the majority of time focused on Dr. Waltke because of all the issues surrounding his involvement with the Biologos blog and his resignation from Reformed Theological Seminary. The focus on Waltke in the panel discussion was unfortunate. I suspect the format for next year’s panel discussion will change so that this type of thing does not happen again. Though I had various reservations with each paper, my strongest disagreement was with Dr. Waltke’s paper defending theistic evolution. The thesis of his paper was that the biblical cosmogony found in Proverbs 8, Job 38-40, and John 1:1-5 as they relate to Genesis 1 allow for God’s creation by natural selection. While Waltke clearly affirms that Adam and Eve are historical figures, distinct from animals, and directly created by God (to see his statement on this, go here), his support of theistic evolution undermines the traditional, literal reading of the early chapters of Genesis and the overall theological message of Scripture (for an earlier critical and beneficial assessment of Waltke’s paper, see Dr. Terry Mortenson’s blog entry). Often new scientific discoveries elucidate the past. The Institute for Creation Research goal focuses on studying cosmogony with Scripture as its foundation. Brian Thomas, Science Writer for ICR, discusses a 2010 discovery that contradicts a prediction of the Big Bang hypothesis “that galaxies should look younger the farther out into space they appear from earth. The ‘mature’ galactic clusters are only supposed to exist close-in, but more were discovered in the far distance this past year, adding to similar observations from prior years.” To continue reading his article “Origins Breakthroughs of 2010: Astronomy,” go here. The following articles in this magazine relate to this basic tenet. “The New Shape of the Debate” by R. Albert Mohler Jr.
“The New Atheism and the Dogma of Darwinism” by R. Albert Mohler Jr.
To read this issue of the Southern Seminary Magazine, click here.